Roof damage is an issue that will affect us all at some point, as we explored in our previous blog post. Once you’ve identified the key signs your roof needs repair, it can be difficult to know whether it only requires a simple fix or whether it may actually be time to replace your roof. In this blog post, we have outlined some of the situations where you may have to decide the best option for your roof and weighed up the pros and cons of following each option. The key signs your roof needs repair tend to be minor leaks, worn material or visibly missing sections. A professional roofer should be able to fix these issues relatively easily by patching over the problem areas or replacing the damaged or missing section. Repairing is a good short-term option because it tends to be much cheaper and far less time-consuming. If you’re on a budget, or you can’t accommodate a large-scale roof replacement at the present time, a simple repair job may be the best option for you. You could also opt for a partial flat roof replacement if you don’t think a complete replacement is feasible for you. A roof replacement will be the right option for you if your flat roof has suffered more serious damage. This can be in the form of multiple leaks, significant wear and tear or partial roof collapse. In these cases it is necessary to replace the roof as the damage will only worsen over time and affect your living conditions. You may also choose to replace your roof if it’s old and difficult to maintain. Although repairing may be cheaper in the short-term, it can actually cost you more money if you have to keep hiring a roofer. Repairing your roof and investing in a quality roofing material could save you a great deal of money in the long run. 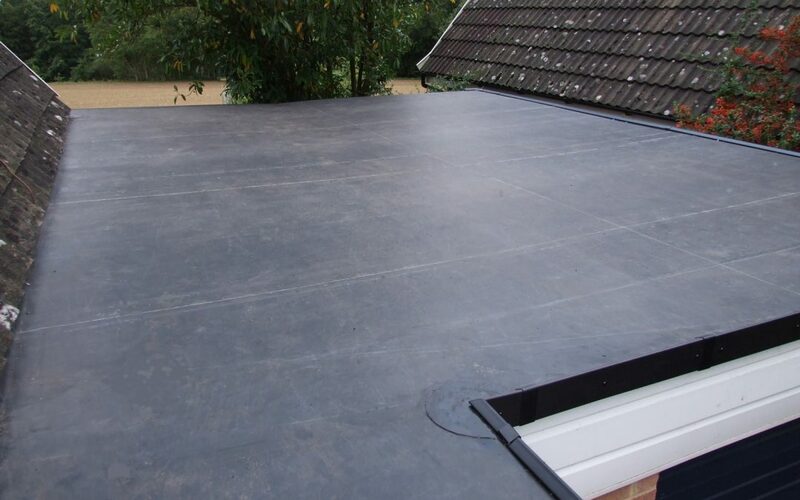 We recommend choosing EPDM rubber for your flat roof, because it is easy to install and maintain, weather-proof, and lasts a long time without needing repair. If you’ve noticed signs your roof needs repair, feel free to get in touch with a member of our team and see if we can help you assess the situation.